Being a cook, a collector of kitchen gadgets and appliances, not to mention a lot of cookbooks, I have always yearned for a proper pantry. Call it what you will, a “Pantry”, “Butler’s Closet”, a “Larder”, it’s a place to store non-perishable food supplies, kitchen equipment, etc. The notion of having a pantry always made me feel warm and secure inside, like drinking hot cocoa in front of the fireplace, when the wind is howling and a blizzard is raging outside. There’s something comforting, knowing that you have a good supply of food laid in should World War III erupt, or one of the numerous fanatic despots on the other side of the world should decide to initiate more terrorist attacks on North America. There’s always a despot lurking somewhere, waiting to cause chaos and maximum damage to unsuspecting citizens in the free world. 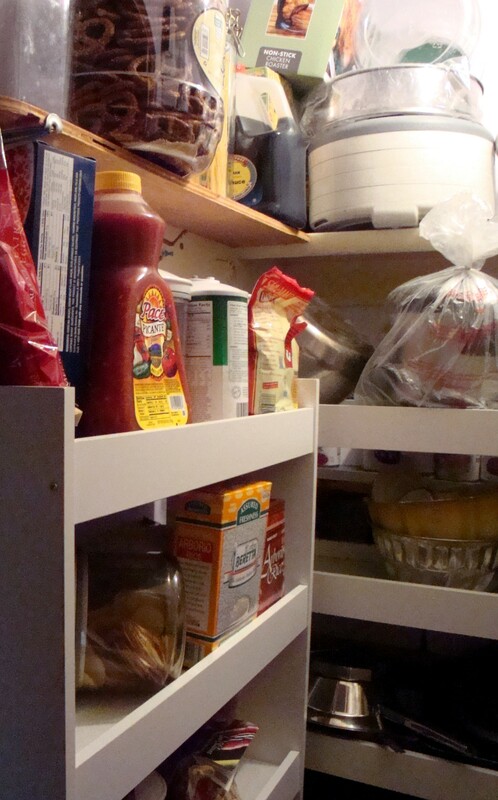 According to Wikipedia, the pantry has been making a comeback in American and English homes since the late 1990’s and is now one of the most requested features in US homes today. They suggest that this reflects the resurgence in “nesting and homekeeping”. So, what was happening in the late 1990’s that made us suddenly start hoarding food supplies? Well, I can think of several things offhand: conflicts in the Balkans and genocide in Rwanda, continued tensions in the Arab world, the Gulf War, the Chechen wars, wars in Bosnia and Kosovo, Al Qaeda, the Oklahoma City bombing, the first bombing at the World Trade Center, not to mention the “Y2K” fears over the dreaded coming of the year 2000, when all hell would break loose. Just the Y2K fears caused many people to start hoarding water and food supplies, gasoline, gas masks and rolls of plastic sheeting (to put over windows and shut out poison gas). Well, the apocalypse did not come, our computers did not turn on us on January 1st, 2000 and the “Rapture“ of May 21st, 2011 was a non-event. Perhaps we have become so accustomed to world tragedies and horrors that we are no longer surprised by what we read and hear on a daily basis. For that reason, maybe we no longer feel the need to hoard, but to ease back and create a pantry instead of an emergency supply centre (I no longer keep candles in my pantry). 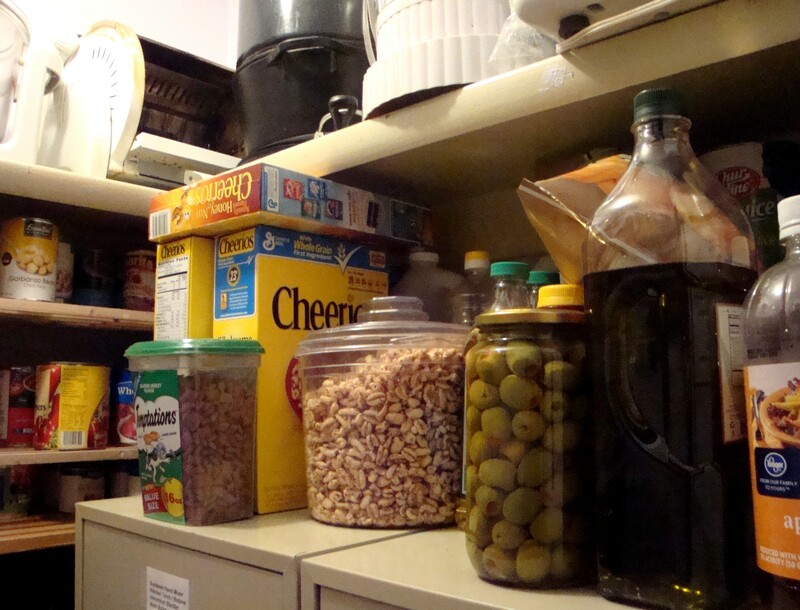 In the 20 years I have lived in my Albuquerque home, the small closet in a small bedroom has morphed from a clothes closet to a darkroom to a storage room to finally, my little pseudo-pantry. 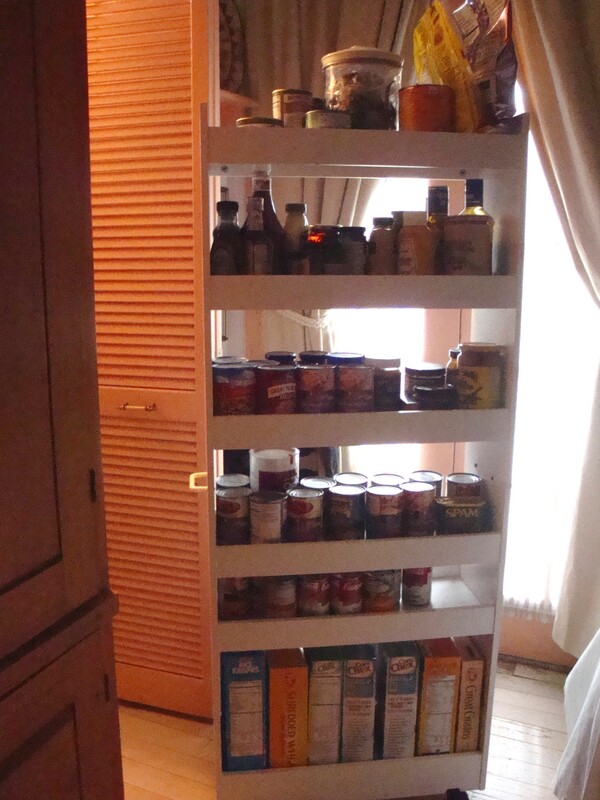 I call it a pseudo-pantry, because it’s not the proper kind of pantry you see in homes in Architectural Digest or Better Homes and Gardens, but it’s mine and I’ve stocked it with care. It gets visited on a daily basis and I even recently created a computerized inventory, which I intended to carefully maintain, so when sales came up at the local supermarket, I could see if I was getting low on diced canned chiles or salsa (mandatory in a New Mexico pantry). However, even the best intentions often fall by the wayside, and alas, my inventory is sadly out of date, which probably explains why I currently have 42 cans of tomato sauce and enough tins of kidney beans to make chili for a small army. 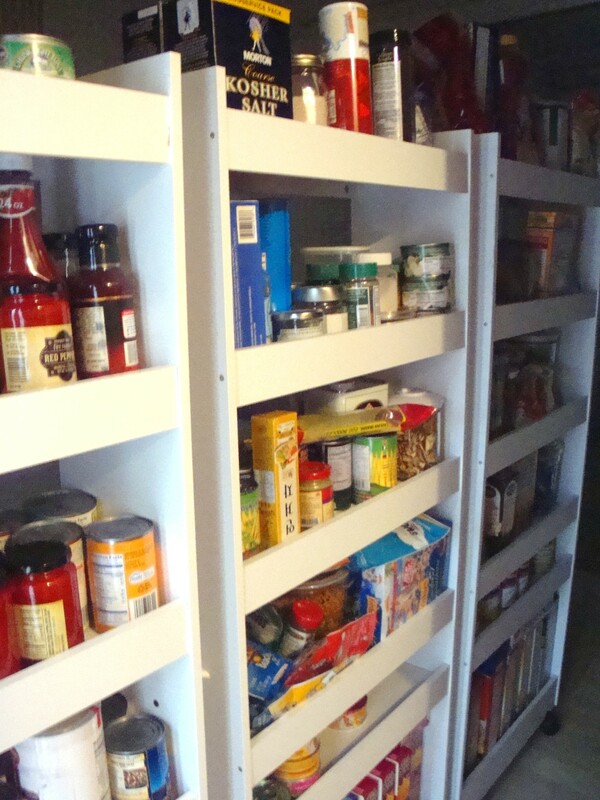 When I decided to empty the closet of it’s last inhabitants and planted the flag for my future pantry, I wondered how I would use the small space effectively. There was already a sturdy shelf running around the top of the closet, which I used to place heavy appliances, but I needed something to accommodate a lot of items. 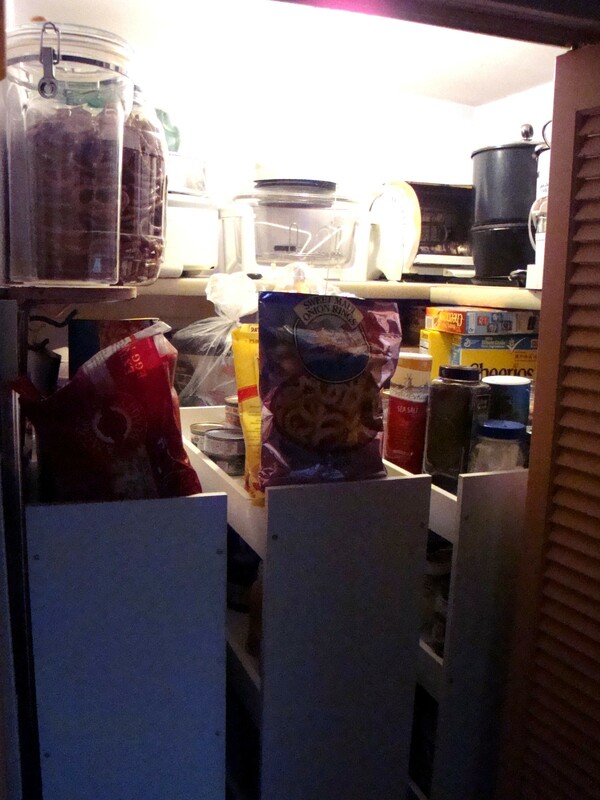 My closet pantry measures 50” by 50” and 90” high. I found a website online, which sold rolling storage units, which are designed for pantry ingredients, clothing or linen, etc. or otherwise more lightweight items. Despite this fact, my units are pretty heavily loaded, however, my spouse did supplement the units with some extra screws to reinforce them and that has been sufficient to deal with the extra weight. The casters are pretty sturdy and have taken a lot of in and out trips over the past few years. No storage space goes unused! Ready for the next Apocalypse? 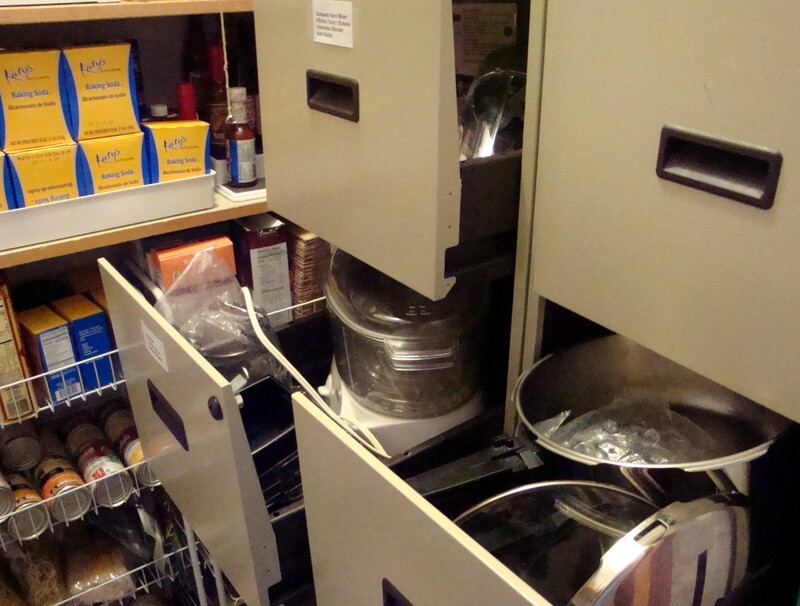 One unit is just for large kitchen wares such as molds, flan pans, storage containers and the like. The units measure 23 ½ “ wide, 9 ¼ “ deep and are 58” high, including the casters. 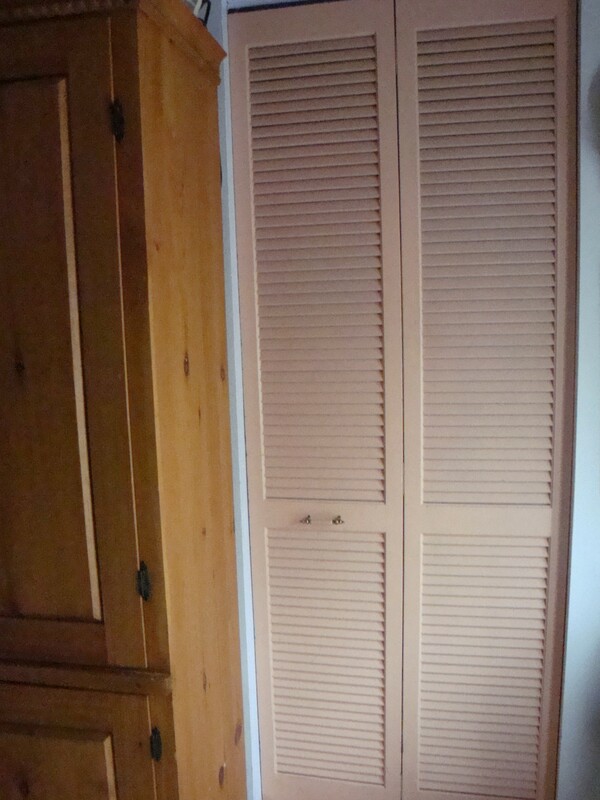 I have 4 units in the closet: one at the rear, against pre-installed shelving, and the other 3 side by side in front. In addition, I have two old filing cabinets, which house smaller appliances, such as a rice cooker, steamer, coffee grinder, etc. 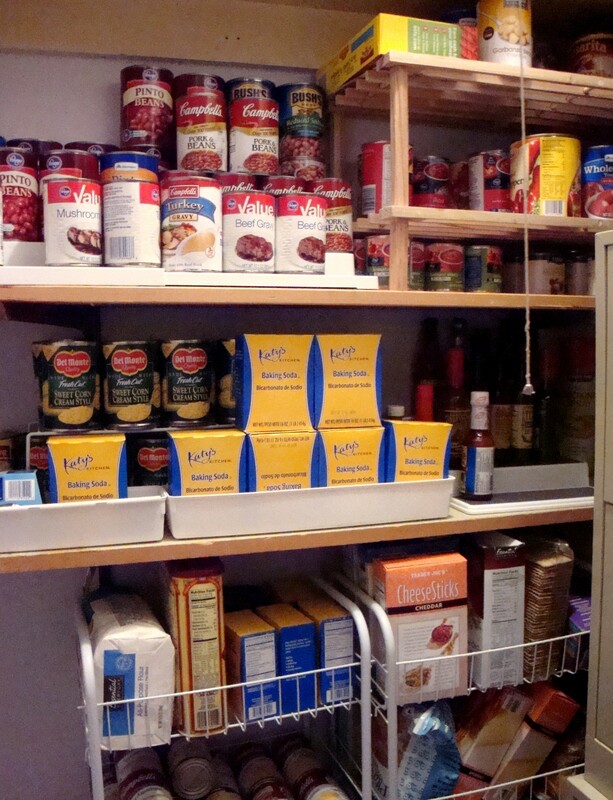 So, in the space of a small closet about 4 feet by 4 feet, I’ve managed to squeeze in a lot of storage space for non-perishable foods, small appliances, etc., thanks to the rolling storage units. It may be small, but it’s functional and I’d warrant a guess that my spouse and I (and 2 cats….they have their own 2 shelves! ), will have enough food to eat to wait out whatever event strikes next. If only we had some place for bottles of water to wash it all down with! 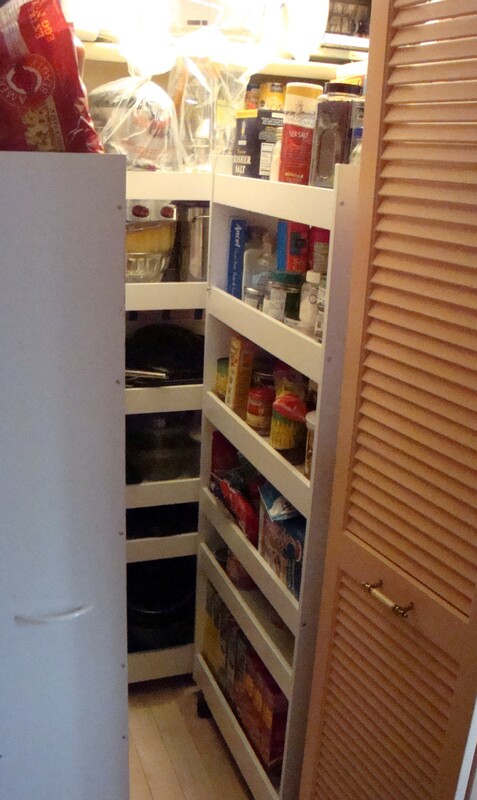 This entry was posted in Comfort Food, Cookbooks, Cooking, Eating, Menu Planning, Uncategorized and tagged Bulk Food, Butler's Pantry, Cooking, Food Storage, Green Chile, Pantry, Storage Closet, Sue Jimenez. Bookmark the permalink. Filing cabinet idea is brilliant! I have two pantries – one off the kitchen (called a larder in Brit-speak) and a slightly cooler one in the basement which I call my cantina. I don’t think know think I could function without these spaces.